Can you please post, share, pass around. Please. As adults you know the Importance of kids getting to school as well as I am sure you can understand as a single mom who has rebuilt our lives for the last 7 years. I chose to leave with no money,no car, nothing but the clothes on our back and the cat. 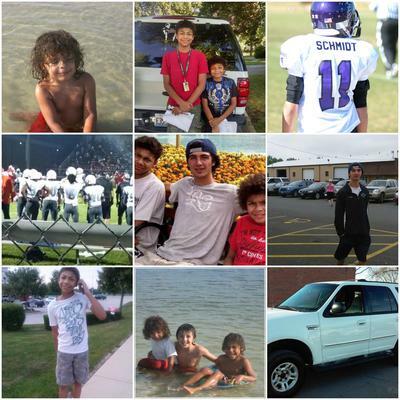 We lived through a very bad dv situation I left with nothing to give my boys a better life. The boys had a hard time leaving their dad, but I think they were just more tired of cleaning up the blood. My middle son would literally push his father away from me. My oldest would take the baby and just hide. It took me 5 years to build up enough money just to buy this truck. It was a very long 5 years we had to walk everywhere. That is why I am seeking help from anyone out here to help get my truck fixed. Without my truck 3 of us are Out Of Work! 2 Middle schoolers Can NOT get to school! 1 High schooler can NOT get home from school! I have 2 boys (11 & 13) in middle school that need to get back n forth to school. We live about a 40 minute walk from the Middle school and 457 feet too close for the dist bus. My oldest son (17) is a Jr. in high school he can take the bus to school but he has football practice after school the latest bus for him to take is at 6pm most days he does not even get out of football until 6:30-7pm. The high school is 4.7 miles from our home. It is just not walkable. It may be great weather today but as we all know in Chicago that doesn't last forever. My oldest son (17) and brother (we took my little brother in last winter cuz his wife was abusing him, after the 3rd ashtray she broke over his head I made him come home our parents are gone and I am the oldest so it was my place to be the big sister and say come home) They Both need to get to work they both work at the same place don't make much but until something better comes along they NEED to get back n forth. Where we live there is NO public transportation they can use. I need to use my truck for work as well. I am an independent ride share driver. So I can not work without my personal vehicle. My hours are limited for being able to work, so I am doing what I can in between getting my family and my neighbors 2 children back n forth to school. My oldest son and I spent 5 days trying to fix it ourselves. needless to say we are just not qualified. So I had hoped the shop could do a simple fix... Nope simple fix is not possible. This is a major repair job. If you would like to verify any of the information Contact is Mike tell him it's about the Expedition. I have created a Go Fund Me page. If you cannot help Please believe me when I say I know what having NO Money at all is, I do understand. Please if nothing else Please share the link with your contacts Friends and or Facebook Friends or Groups. If Somebody knows what I'm going thru please help me and my 3children!!!! !